Perfect for one cup portions - No mess, no fuss. Tea for me! This one cup tea infuser is so handy for loose leaf tea wherever you are - handles hold infuser in place over the edges of your cup - If you like to wait for your tea to brew without disrupting the task you have in hand this is the gadget for you. Take it with you to your desk, or even to the potting shed. No mess, no fuss. 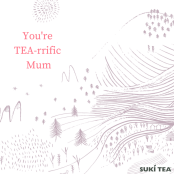 Suki Tea gift sets are the perfect Tea gift for any Tea fanatic! Choose from a Loose Leaf Tea Gift Set, Pyramid Tea Gift Set or Build your own bespoke Tea Gift Set! 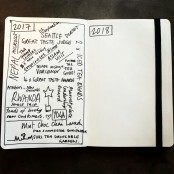 2018 promises to be an exciting year! Everything went as it should. Thank you. I did have a plastic version from amazon but the tea stained it so badly it eventually looked awful. This one is well made and big enough for the tea to steep well inside the mug. It washes well in the dishwasher and the little dish is very useful too. I love it, once again another wonderful product from... I did have a plastic version from amazon but the tea stained it so badly it eventually looked awful. This one is well made and big enough for the tea to steep well inside the mug. It washes well in the dishwasher and the little dish is very useful too. I love it, once again another wonderful product from Suki tea. Service rating : Fast efficient from start to finish. Service rating : Suki tea - great flavours available, great quality and great accessories. I especially love the “Tea of the Month” offers. Product : Super handy, I’ve one at home and one in work. Service rating : Delicious teas - smell and taste lovely. Also really pleased with little caddies - very stylish and big enough to hold the different teas without taking up too much room. I made labels from the tea packets so I know what is in each. Arrived quickly; would highly recommend Suki... Service rating : Delicious teas - smell and taste lovely. Also really pleased with little caddies - very stylish and big enough to hold the different teas without taking up too much room. I made labels from the tea packets so I know what is in each. Arrived quickly; would highly recommend Suki Tea. Product : Perfect for one cup - also reuse to get second cup from the leaves. Quick delivery - especially when down to one's last spoonful of tea!